8 minute excercise | Christoph Gelsdorf, M.D. Can you spare 8 minutes for exercise? Doctors and health professionals have known for a long time that regular exercise benefits health in many ways. From heart disease to brain disease to cancer to mental sharpness, people who maintain an exercise regimen over the years live longer and more vigorous lives. The results are so convincing that research now focuses not on whether exercise is good for you but rather on determining the right amount of exercise, the right type of exercise, and why it is that exercise is so beneficial. For the last decade or so the standard recommendation has been to aim for 150 minutes of moderate exercise (ie: walking) or 90 minutes of vigorous exercise (ie: swimming, biking, running) per week. Health professionals think that ideally exercise should combine aerobic activity that makes your heart and breathing go fast, with muscle strengthening activity that makes your body feel sore. For people with sedentary professional lives, achieving the target amount of exercise requires considerable willpower and setting aside an appropriate amount of time. At my clinics in Yangon and California my patients have been fairly consistent in the excuses they give for not exercising: not enough time, the gym/pool is too expensive, no open space near the home, the streets are not good for biking, exercise is too boring, etc. Because these excuses are so common, interest is rising in finding more acceptable ways for people to enjoy the benefits of exercise. A newer area of research is High Intensity Interval Training, or HIIT. Proponents of HIIT are hoping to prove that short bursts of exercise, which require much less time but rigorous effort, are equally beneficial to the 30-60 minute exercise routines that are the current standard. Data so far seems to indicate that HIIT achieves increases in metabolic rate – resting energy expenditure – that are equal to longer workouts. In addition, molecular changes inside muscles appear to be similar in short, high-intensity exercise and moderate-intensity endurance exercise. An article published earlier this year in the American College of Sports Medicine’s Health & Fitness Journal, and later covered by The New York Times, suggests a routine for those who may be interested in quick fix activity. The exercises shown in the graphic (above) are each done at maximum intensity for 30 seconds. Maximum intensity means it should feel quite uncomfortable. Between each exercise you take a 10 second rest that allows for muscle oxygenation. 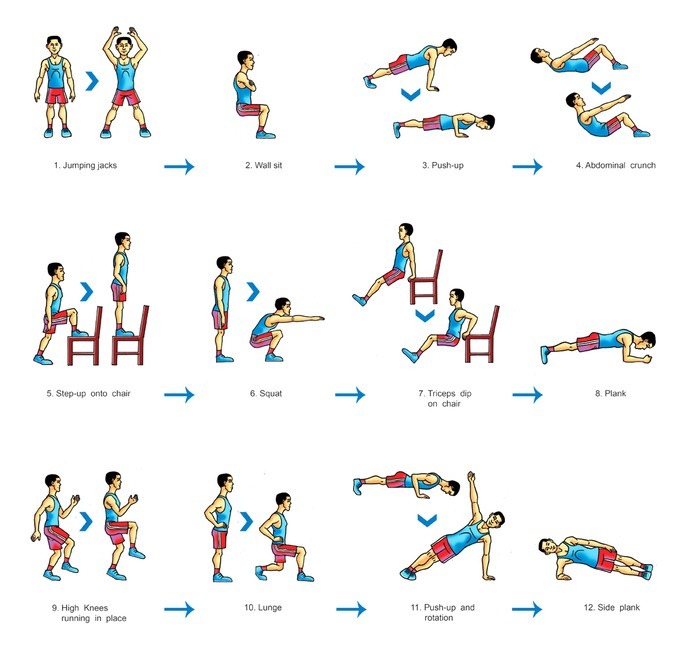 To be effective, the full set of exercises must be completed, making total exercise time just short of 8 minutes. The article authors attempted to design a routine that involves all major muscle groups in a balanced fashion, alternates between opposing muscle groups to maximise recovery time, and switches between high and low heart rate activities. The advantage of an exercise routine such as this is that it’s quick. Also it can be done almost anywhere and requires only a wall and a chair. A person’s own body weight is used to provide resistance. The challenge is ensuring that you perform the exercises with sufficient intensity to realise the benefit.